The Chino Brew & Chew is returning for another round on Sunday (April 8). The event brings together breweries and food trucks from the Inland Empire and beyond in a fundraiser for Soroptimist International of the Chino Valley. 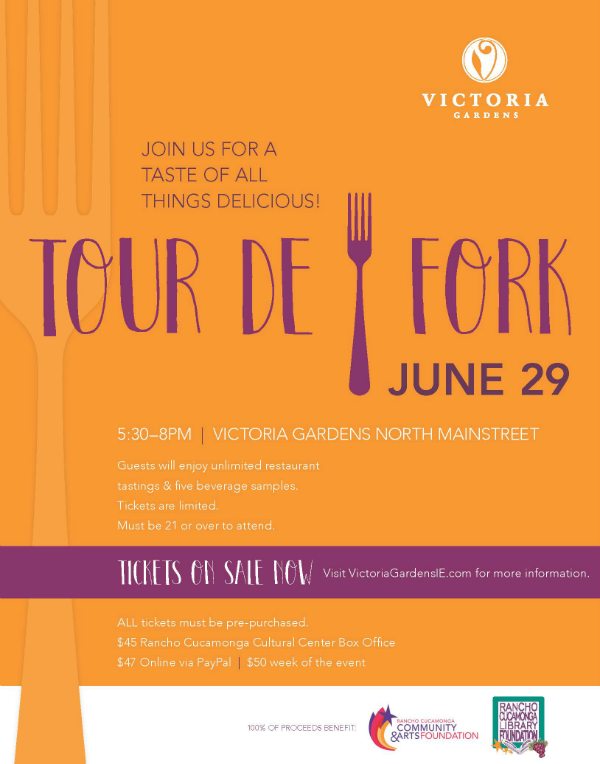 We’ve mentioned before that one of our favorite Inland Empire food events is the Tour de Fork at Victoria Gardens in Rancho Cucamonga. Last year, the event sold out rather quickly, but this year, if you’re interested in going, you’re in luck. That’s because tickets are still available for the event, which is set for 5:30 to 8 p.m. June 29 along the center’s North Mainstreet. 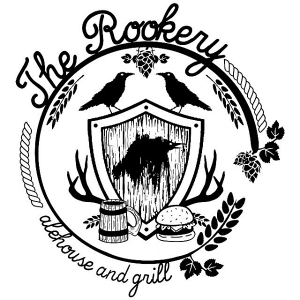 Pomona’s The Rookery Alehouse and Grill is celebrating its third anniversary from 11 a.m. to midnight today (January 15). The pub will be tapping several special brews for the event, including two collaborations with local breweries. The eatery combined with Pomona’s Sanctum Brewing Co. on Unicobra Fire Cannon and with Riverside’s Polymath Brewing Co. on Saisons of the Stone Age. For a limited time, the Coffee Bean & Tea Leaf has added a latte macchiato to its beverage lineup. For the next three Mondays (January 13, 20 and 27), guests can try a small latte macchiato for just $2. Flavor choices are caramel, vanilla bean and dark chocolate. Another brewery — La Quinta Brewing Co. — has opened in the Coachella Valley. You can currently find the brewery’s beers at dozens of area locations, and the tasting room has been open for about a week now, but the brewery will be celebrating its grand opening on Friday (November 22). The event kicks off at 4 p.m. and is scheduled to last ’til 8 p.m. Guests will get 20% off beer and merchandise. 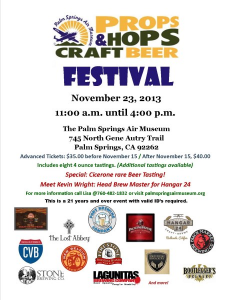 We had a blast at last year’s Palm Springs Props and Hops at the Palm Springs Air Museum, and this year’s edition is happening Saturday (November 23). 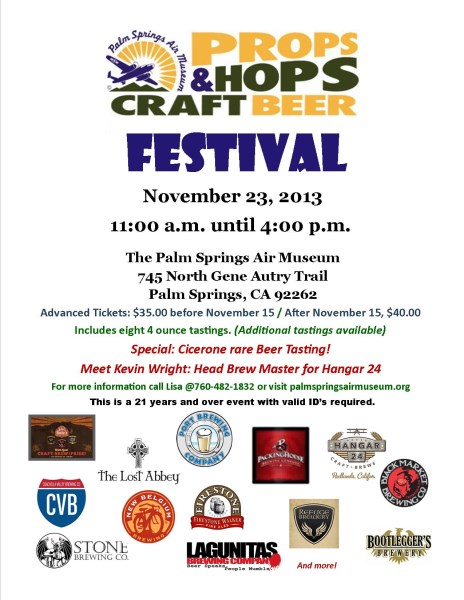 The event will run from 11 a.m. to 4 p.m. at the museum, 745 N. Gene Autry Trail, Palm Springs. 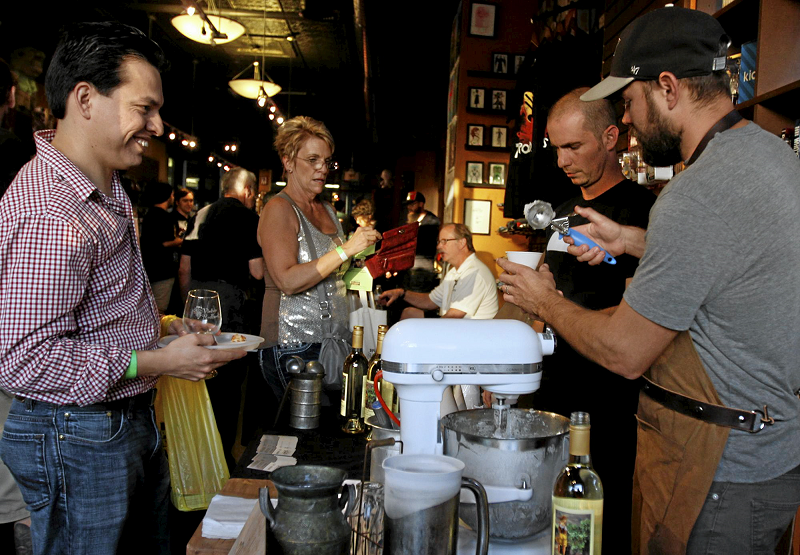 Tickets, which include twelve four-ounce tastings, are $35 “before November 15,” and $40 after (including at the door), but are still available at the lower price by clicking here. Sixteen brewers from Southern California and beyond are scheduled to participate. Read on for the list.